T-Mobile definitely has some caliber Android smartphones right around the corner, but it looks like potential T-Mobile customers are going to have to wait through September and half of October until those devices launch. Based on the title, you can probably deduce that I am referring to the Samsung Galaxy S II and the HTC Ruby — two superphones expected to replace the Sensation as the flagship devices on T-Mobile. 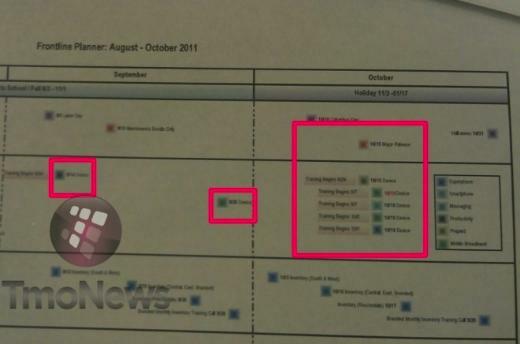 Judging by a recently leaked T-Mobile roadmap, the HTC Ruby and/or the Samsung Galaxy S II are expected to launch either on October 15 or October 19 — both dates have been tipped to feature major launches. An unknown tablet is also expected sometime towards the end of October. Lastly, the BlackBerry 9360 is expected to launch on September 14th, in case Android isn’t your cup of tea.